Ohler reads the death (line 1) is false. The last letter is not a "Samech" סAs Ohler reads (numerical value 60, that is 660 = 1900), but a "final Mem" ם with the numerical value 40 (i.e. 640 = 1880). Possibly Ohler was his reading safe because the 25th Iyar in the year 5660 also was a Thursday and the day of the week in the Hebrew inscription (line 1) is specified, "on Day 5 (Thursday)" On ". Ansel Fox carries (line 3) intra-communal title "Morenu" Rabbi. annotation: Morenu literally means "u (ur) L (ehrer), H (err)". 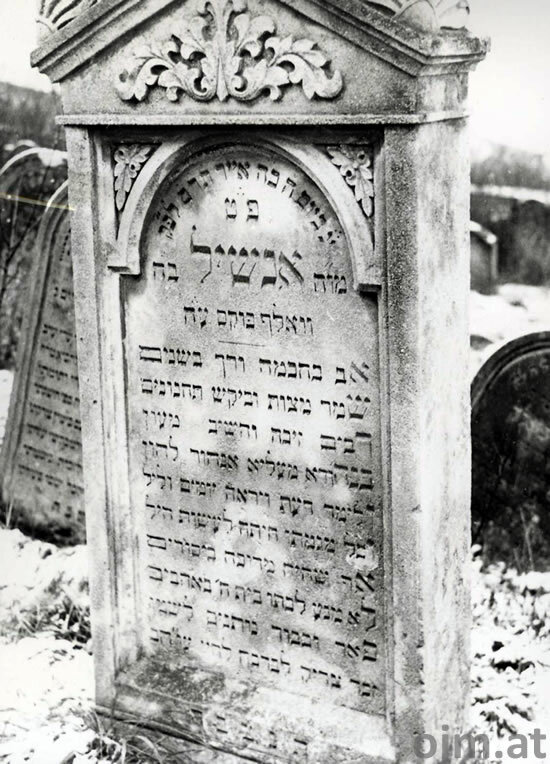 The Morenu title received only very learned men, Bernhard Wachstein called him a "synagogue Ph.D." (See Bernhard Wachstein, The inscriptions of the Old Jewish cemetery in Vienna, the first part of 1540 (?) - 1670, the second part of 1696 to 1783, Vienna in 1912, the second part, S. 15). 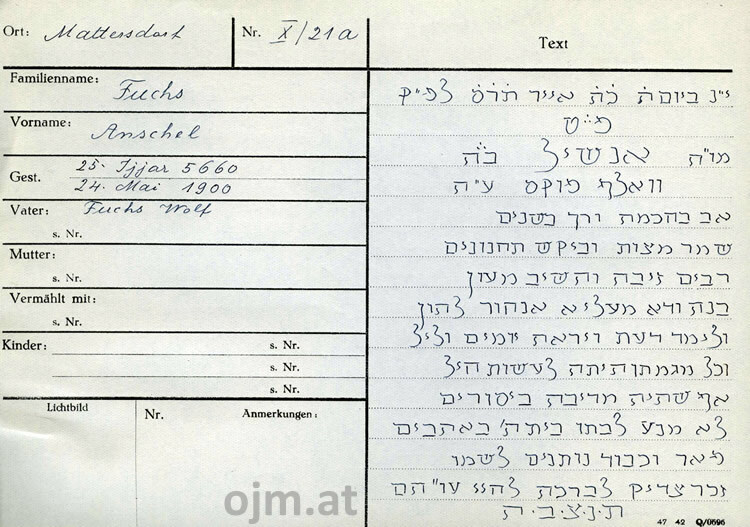 The father of Ansel Fuchs (line 4) "Wolf Fuchs, a (uf persuaded that) F (rieden)" Wolf Fox AH. "A father in wisdom and tender in years" indicated the young age of death - in line 5 of the Hebrew inscription is - consistent with the parish registers Father wisely and soft in. See Rashi on Genesis 41.43 (Joseph story: Joseph authority over Egypt, and Bereishit Rabba 90.3), which states: "... R. Judah said, Yeshiva student which is Joseph, who was a father of wisdom and young in years ... ". In line 11 and 12 states: "Although he was oppressed by suffering, (12) it did not prevent him to go to the synagogue in the middle of the pious" Although it was a mortar suffering did not prevent passing the House, "making love. The entire Lobteil (line 5ffWith the exception of the last two lines) consists of a couple rhymes. his first name "Ash (not Ansel '!)" 7 - as acrostic find out from line 5 which"(It Mr) son d" in line 8 Build", From line 9 to 13 of the first name of the father "Wolf" Wolf. 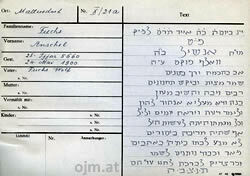 (In line 14 then the Segenswunsch "the memory of the just may be preserved" Righteous memory be blessed). The grave stone of Ansel Fuchs is today - inserted into the wall - (in the Jewish cemetery in Mattersburg see Group 1/3). Sterbematriken: Adolf (Ansel) Fuchs, Born in Kobersdorf, wh. Mattersdorf 364, Widowed, Occupation: no (sic), died May 06, 1880 with 35 years of gangrene. Your email address will not be published. Required fields are marked with * marked.